The Plunge is such an exciting adventure. It is for the world-shakers who want to step outside their daily comfort zones and make a difference. It is for change-makers who want to push themselves to the limit, climb out of their boxes and stretch themselves to become better versions of themselves. Plungers strive to choose the best life possible. They choose joy. They are ready for whatever journey is in store for them every time the Plunge lands in their inbox. 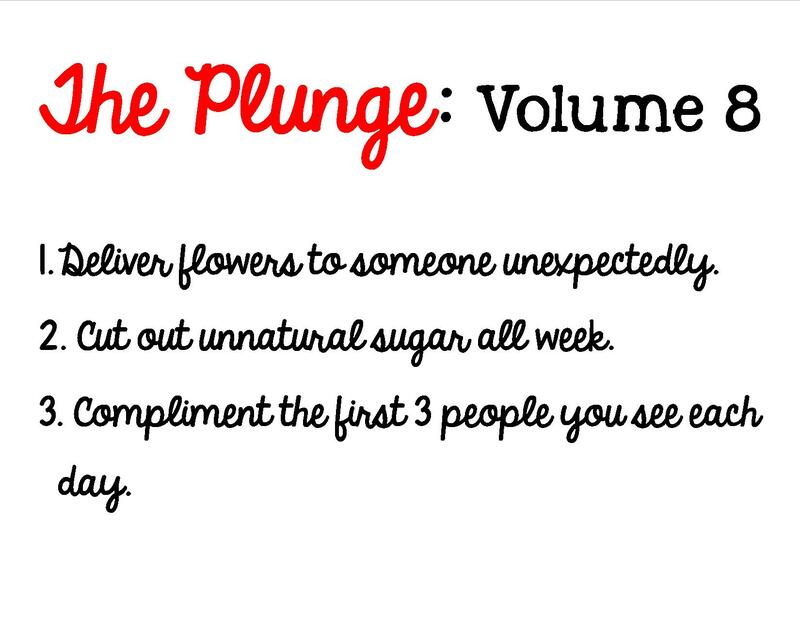 The weekly Plunges have provided a creative avenue to show kindness, get gratitude, and change the world around us. 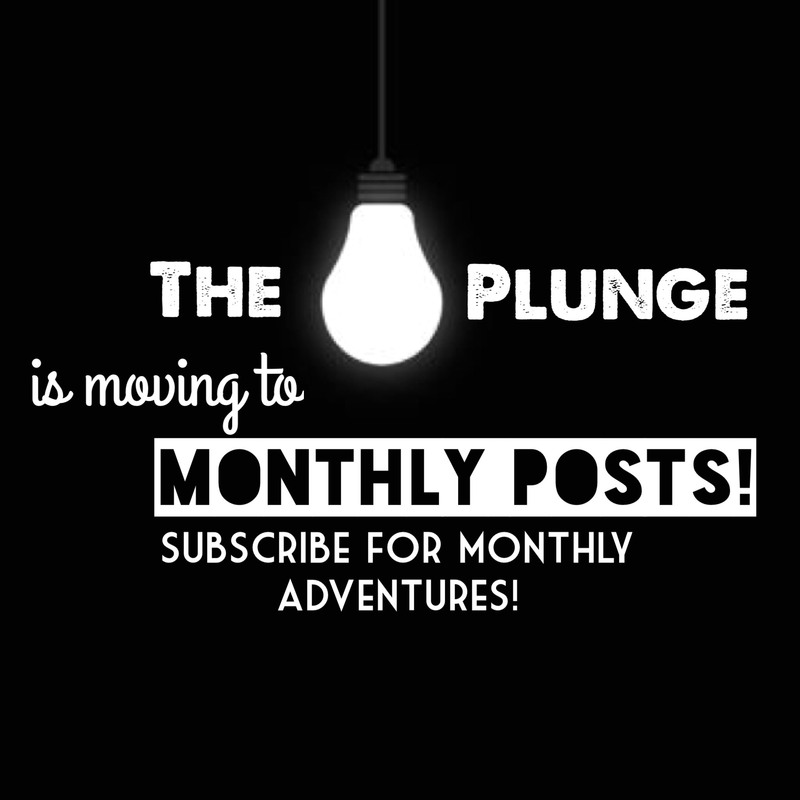 And now the Plunge will be moving to monthly posts to give Plungers more time to get creative about their plunges. After this weekly post (Volume 8), the next post will land on February 1. That will give you an entire month to complete your challenges. So be prepared for the challenges to get a little more adventurous, a little more challenging, a BIGGER PLUNGE!!! Are your ready? I know you are!!! But for now, on to Volume 8. It is winter. The trees are bare and beautiful and snow is covering the ground. But as much as I love the change of seasons, I miss the flowers. I love flowers. My family makes fun of me because as soon as spring comes around, I am excited to make our trip to the store to buy my flowers. I love the color and the beauty. There is something about flowers and the way they brighten the room, fill the yard with sunshine. Although flowers are often seen as a romantic gesture, they are also a beautiful gift when given for absolutely no reason. A couple months ago I gave a friend some roses for no reason – and it was fun watching her confusion (why did you give me these?) turn to joy (just because I love you!). This website has 50 different kinds of paper flower templates you can create if fresh flowers aren’t your forte. Or, you can visit this blog and make a beautiful paper rose. But I myself absolutely love fresh, beautiful bouquets of flowers. If you need them fast and delivered, visit one of the online flower companies like FTD. But nothing beats stopping by your local florist or Kroger and personally picking out a gorgeous bouquet and delivering it yourself. Deliver flowers to someone unexpectedly. This next plunge is going to be tough for some of you. I’m not going to say much about it for fear some of you may reach through the screen and hit me. But you can do ANYTHING for one week, right? I believe in you. You can do it. It will be good for your body. You might even drop some weight! Here it goes…I’m bracing for your response! Go without sugar for this entire week. Isn’t it always a pleasant surprise when people compliment you? Especially sincere compliments that are meaningful. If you’re not sure how to give a meaningful, specific compliment, check out this article about giving compliments. Watch this short video about a high school kid who decided to give compliments. He is changing the world around him with kind words. There are many people in the world who only hear negative words, never positive. Let’s be positivity harbingers this week. Let’s be full of compliments. Compliment the first three people you see every day this week. Focus on sincerely complimenting as many people as you can each day. I’ve been thinking a lot about the spiritual value of these Plunges. As I venture deeper and deeper into the Plunge, I find I’m taking more risks. But not only that, I’m holding myself accountable to consistently forcing myself to do more outside the box. Jesus LIVED outside the box. Everything He did was weird, strange, and different to those around Him. He was a world-shaker, change-maker. Jesus went out of His way to love the undesirable, encourage those who didn’t often love Him back, and care for those who needed it most. That’s why I love the Plunge. Because I want to be weird like Jesus. Daily, I mess up. I’m broken. I don’t hit the mark. But His grace reminds me that He is sufficient. So I just pick my cross back up and follow Him. The Plunge is not about guilt or fulfilling a quota. To get your feet dirty and walk that narrow path. Posted in The Plunge and tagged adventure, kindness, plunge. Bookmark the permalink. I love surprising people with flowers – even though I live overseas, I usually find a few times a year to surprise family members with a bouquet delivered to their door! What a great idea, Em!